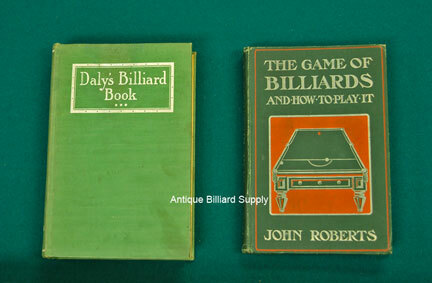 #12-11 Daly's Billiard Book (left), 1934 edition, is an excellent reference book for pool enthusiasts. Extensive discussion of position play. Illustrated with more than 400 diagrams, 30 technical photographs and three "strategy maps." 276 pages, about 5 inches wide, 7 inches tall, good condition $150. "The Game of Billiards" (right) by John Roberts, was published in London. This 1905 first edition includes 142 diagrams of interesting shots, often on the snooker table. Includes instructions on cleaning and maintaining the pool table and equipment. 124 pages, about 5 inches wide, 7 inches tall, fair condition, $225.